Calcium and magnesium are essential minerals for developing and maintaining healthy bones and muscle function, while vitamin D helps to enhance absorption of calcium in the body. 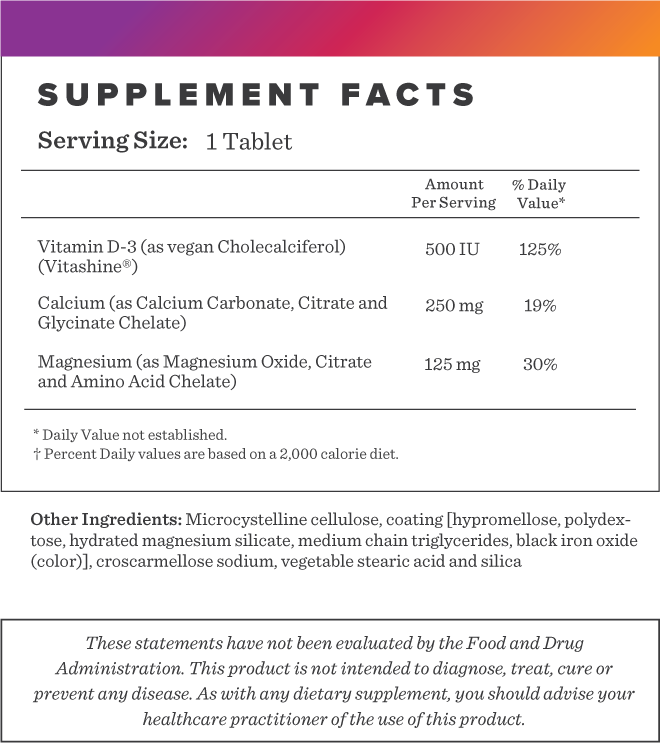 Our vegan Calcium/Magnesium supplement contains Vitamin D3 (as vegan cholecalciferol) (Vitashine®). 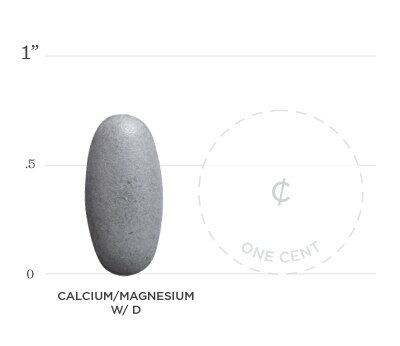 Calcium and magnesium are two of the most critical and abundant minerals in the body. Every cell in our body relies on these key nutrients and most people don''t get enough through diet alone. Calcium is known for its role in bone health while magnesium has been shown to help with muscle relaxation, reducing inflammation, and even maintaining blood pressure and glucose levels. Calcium is necessary for heart, muscles, and nerves to operate properly. Vitamin D3 helps optimize calcium absorption, encourages bone function, healthy cartilage and maintenance. 2. Shobeiri F, Araste FE, Ebrahimi R, Jenabi E, Nazari M. Effect of calcium on premenstrual syndrome: A double-blind randomized clinical trial. Obstet Gynecol Sci. 2017;60(1):100-105. 3. Margolis KL, Ray RM, Van horn L, et al. Effect of calcium and vitamin D supplementation on blood pressure: the Women''s Health Initiative Randomized Trial. Hypertension. 2008;52(5):847-55. Below we've broken down the main functions of our Cal/Mag with D and the benefits it can provide. Calcium, magnesium, and vitamin D, taken with a healthy diet and physical activity may reduce the risk of osteoporosis. This combination has also been shown to reduce the risk of falls in older adults. Research shows that calcium and magnesium may decrease symptoms of PMS, including abdominal bloating, lack of energy, and irritability. Calcium, magnesium, and vitamin D have been shown to reduce blood pressure, assisting blood vessels to tighten and relax.